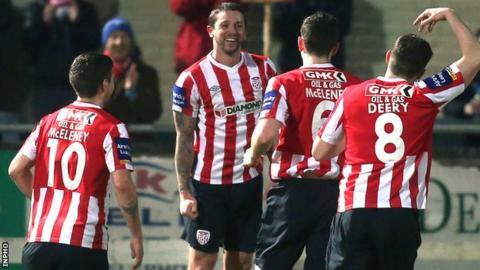 Derry failed to build on Rory Patterson's early goal as they drew with Drogheda in the Setanta Cup quarter-final first leg. Patterson fired a low free-kick past keeper Gabriel Sava to give the Candystripes a 10th minute lead. Michael Rafter headed over for the hosts before Sava made a good save to deny Barry McNamee. Drogheda improved in the second half and Declan O'Brien levelled with a low strike after 53 minutes. Patterson hit the corner of the net from 30 yards to give Declan Devine's team the perfect start at the Brandywell. Drogheda's best first-half chance came on 29 minutes when Gerard Doherty tipped over an Alan Byrne header after the keeper failed to clear from a free-kick. A mix-up between Stewart Graecen and Ryan McBride let O'Brien in to fire in the equaliser early in the second half. The game fizzled out in the latter stages and the tie is finely poised ahead of next Monday's second leg.